A few years ago, the first lump of plutonium scientists ever made on Earth was removed from display in Berkeley's Lawrence Hall of Science and then forgotten about. Berkeley physicists think they've finally found it again–thankfully before it got thrown out as radioactive waste. This precious lump of plutonium dates back to 1941. Plutonium doesn't exist naturally on Earth, except in trace amounts. So to study plutonium, scientists first had to make it. Berkeley physicist Glenn Seaborg got access to a newly built cyclotron, where he and his collaborators bombarded uranium with neutrons. The material then decays into the new element of plutonium. After a year, they had enough plutonium for the first sample large enough to weigh. It was all of 2.77 micrograms. Seaborg would go on to win a Nobel Prize for his discovery of plutonium and other transuranium elements. The room where he did his work in Gilman Hall has since become a U.S. National Historic Landmark. 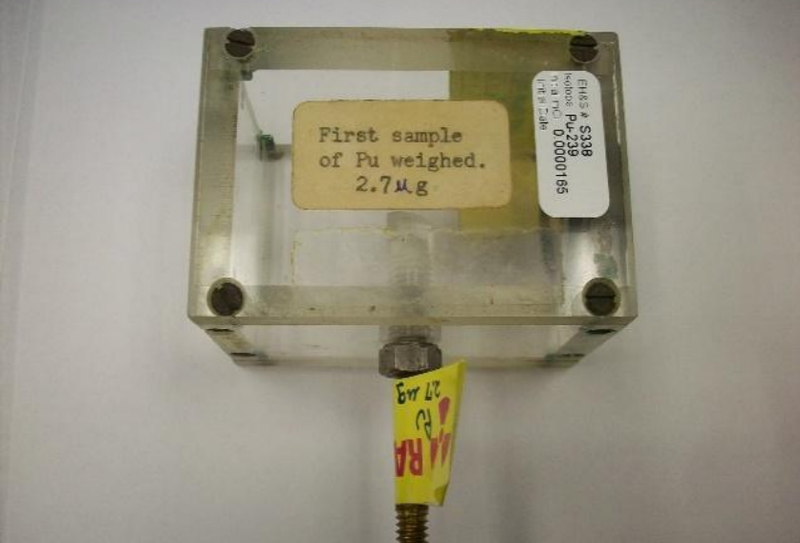 That historic sample was converted into plutonium oxide and placed in a glass tube, where it was put on display in Berkeley's Lawrence Hall of Science. In the late 2000s, however, the plutonium sample removed from display due to some changes in the exhibit space. The sample put away—except the paper trail had disappeared. Some time later, a box labeled "First sample of Pu weighed" was found at the Berkeley's Hazardous Material Facility, a waystation for hazardous waste. Thankfully, a knowledgable eye saw it and discerned its historical value. It turns out that plutonium created in a cyclotron is very different from most plutonium, which is created inside nuclear reactors and then separated from spent nuclear fuel. That's because this stuff always contains another isotope, plutonium-241. This is a half-life of just over 14 years and decays into americium-241. So samples of plutonium from nuclear reactors, always contain americium-241 in amounts that grow over time. What's more, Am-241 in turn decays producing gamma rays with an energy of 59 kiloelectron volts. Eric Norman's lab at Berkeley's Department of Nuclear Engineering monitored the sample for gamma rays with an energy of 59 kiloelectron volts. They didn't find any, meaning the sample was most likely created in a cyclotron like Seaborg's. In addition, the mass matches up. The evidence all points toward this being the missing plutonium. This post has been corrected to reflect how the plutonium was stored and why the plutonium was removed from display. Top image: Norman et al.